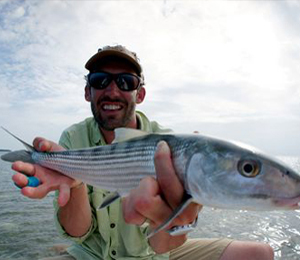 The bonefish is a popular Key West fish targeted by anglers. This, however, it is not because of their taste. Instead, their popularity stems from the voracious fight they provide fishermen. Locally, they often go by the moniker the "Grey Ghosts" because of their reclusive, fast-swimming nature. Their ability to avoid anglers has dubbed them their ominous nickname. In addition, their appearance lends itself well to the name. Their mirrored, silver scales reflect the fish's surroundings making them very difficult to spot. This comes in handy when trying to avoid predators such as sharks, barracudas and fishermen. 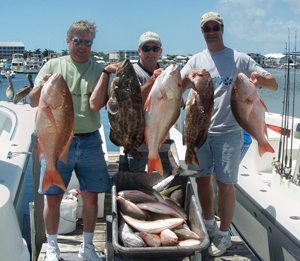 At maturity, these sport fish can reach lengths of 17 to 18 inches and weigh 16 pounds. They have a rounded snout with a downward facing mouth that comes in handy when searching the sand for food. They have muscular bodies lined with silver scales that sport dark streaks along its back and sides. 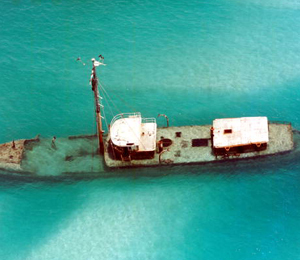 When seeking out these elusive Key West fish it is important to venture to their desired habitat. Typically, bonefish reside in inshore marine waters. As adults, they stick to shallow flats among sea grass beds and sandy bottoms. If can be difficult to access these areas by boat, so it is often best to turn the engine off and use a pole to push the vessel to the desired location. When sifting through the sand for prey, their deeply forked tail is often seen sticking up from the water. This act is known as "tailing" and is a telltale sign that you are in the right place to land one of these fish. Bonefish are year-round residents but will seek out deeper water in winter. Thus, the months of April through October are prime season for this fish. They are equal-opportunity predators that will attack a variety of species. In fact, research on the fish's stomach contents has shown that they will eat more than 100 different types of prey. However, they often target small crabs, snails, worms, shrimp and small fish. These species make up the bulk of the fish’s diet. It is best to target the this species while they are feeding. They will often be too caught up in finding food to notice an approaching vessel. This creature’s camouflage isn't their only defense against predators. They are built for speed, which comes in handy when avoiding attackers. They also have large eyes that allow them to flee at the first sign of danger. This makes them quite a challenge for anglers as well. Fishermen who are lucky enough to find one on the end of their line should be prepared for a lengthy fight. They have been known to run up to 75 yards. 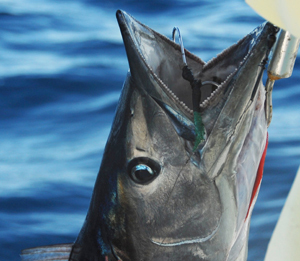 Their fight provides a challenge for even the most experienced angler. It is important to cast your bait a good distance away from the fish so that it does not get spooked. Twitching the bait as the fish approaches should warrant a bite. Although just getting a bit from this species can be a challenge, the fight is far from over. It is important to be patient and wait for the right moment to bring this fish in.